The small and isolated population of the Marsican brown bear has been protected since the establishment of the National Park of Abruzzi, Lazio and Molise in 1923, but despite many conservation efforts it is still considered endangered. It is therefore one of the focal species of the Rewilding Apennines initiative piloted by Rewilding Europe. The Marsican bear, also known as Abruzzi brown bear, has been separated from the Alpine population for at least 4’600 years. It has a common genetic lineage with bears in the Balkans and shows a low genetic variability but does not suffer from inbreeding. As it has remained completely separated from the main European bear population in the Alps and in Central/East Europe for several centuries, the population of Abruzzi brown bear can be considered a relict one and this animal clearly shows unique traits for the species, possibly developed in its isolation, namely a smaller size, some skeletal differences, a much less aggressive attitude, and a certain tolerance toward the human presence and activities. These bears still live in a densely inhabited country like Italy and less than 150 km from very large cities such as Rome, which makes their survival until today an even more remarkable fact. Despite considerable attention and conservation efforts during the last decades, their future remains uncertain. 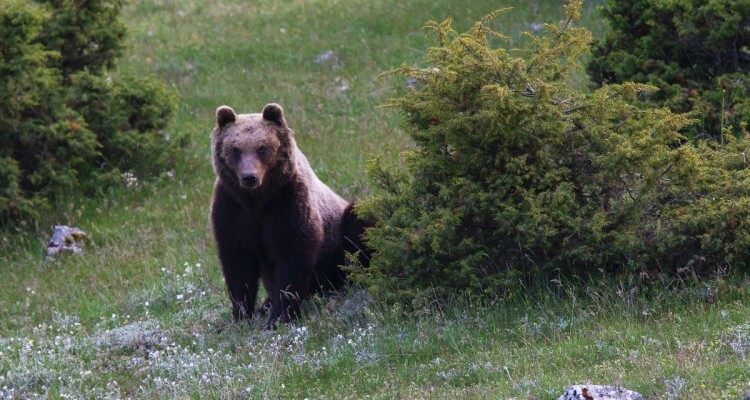 The project is anchored in PATOM (Piano d’Azione Nazionale per la Tutela dell’Orso Bruno Marsicano) – the Italian national action plan for the protection of the Marsican brown bear.